There will come a time when employees feel that they should explore other opportunities and leave their current jobs. However, one cannot just simply walk out of the company just like that, which is exactly the reason why those who would like to quit their current jobs must learn how to write a simple resignation letter. With the help of a free resignation letter, an employee can make sure that the employer knows that he or she intends to quit. This will also ensure that the employer understands that the employee is going to resign on a specific date, giving the employee time to prepare for the employee’s departure. 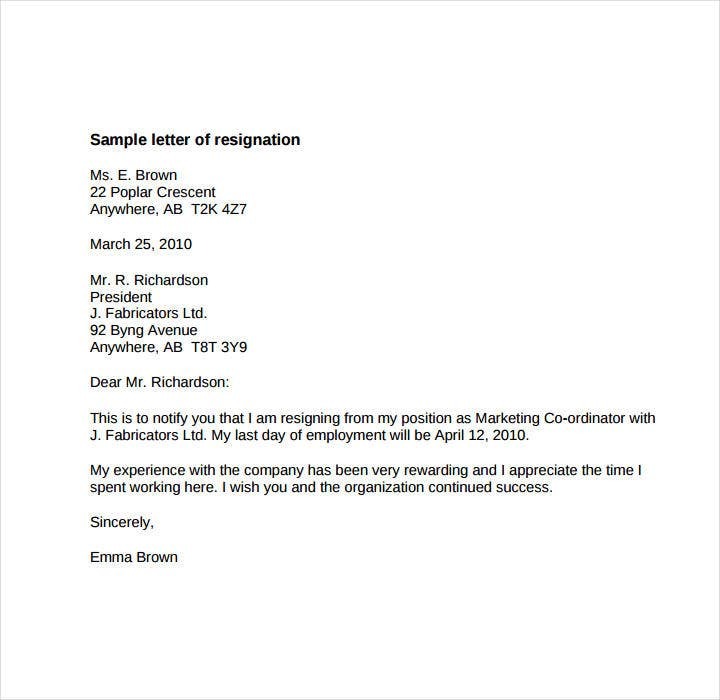 What is a Short Notice Resignation Letter? In the event that one has to resign from his or her job, then that person would normally have to give his or her boss at least a two-week notice before he or she leaves. 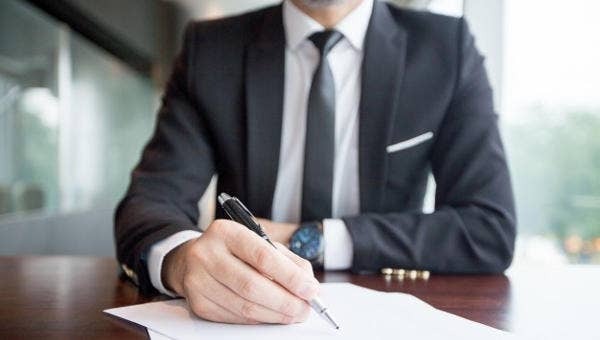 As mentioned before, giving the employer a letter of resignation will make it much easier for him or her to prepare for the employee’s departure as well as make sure that the transition process goes smoothly. However, sometimes that’s just not possible as an employee might just have to leave on short notice or even immediately. This is exactly why some employees have to make use of short notice or immediate resignation letters. 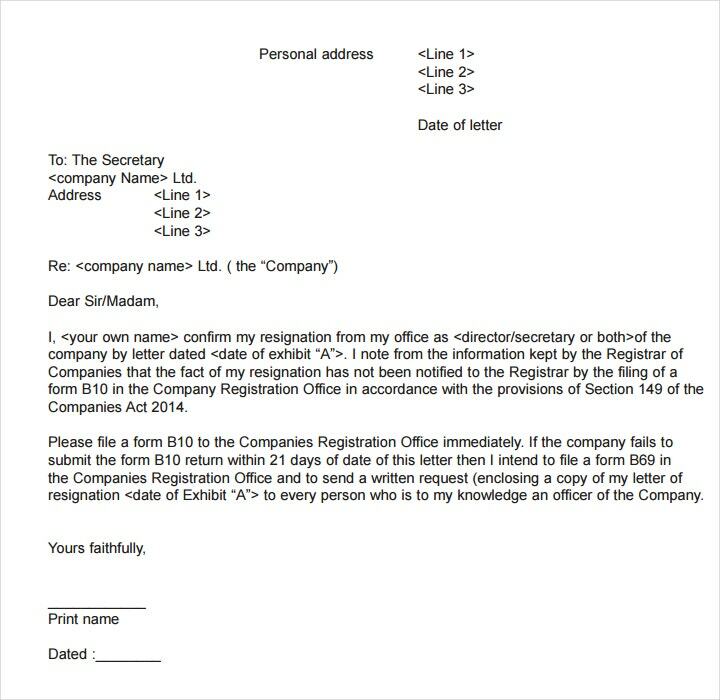 A short notice resignation letter is what one hands to an employer in the event that he or she has to leave the company due to reasons such as a personal emergency or even intolerable working conditions. The employer will appreciate as much notice as the employee can give, so it’s always best that the employee tells the employer when he or she is definitely leaving. Make sure that your letter is in the business letter format. 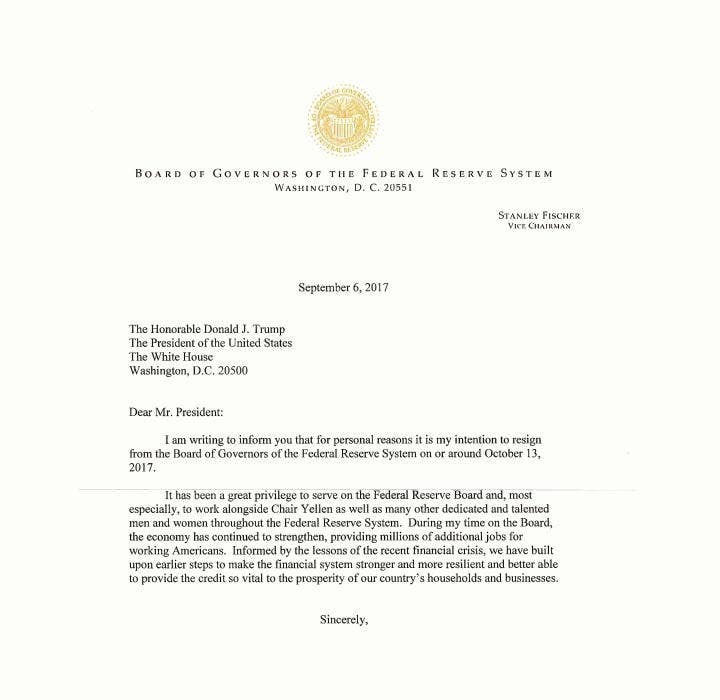 Since this letter will go straight to your employment file once you submit it, it’s best that you follow the business format to make sure that your letter has an air of professionalism to it. So when you write the letter, make sure that the top left of the corner contains your contact information, the date the letter was written, and the contact information of your employer. Then end the letter with your handwritten signature along with your name right below your signature. State the date of when you plan to resign. This is important as your employer has to know when you’re going to leave the company. 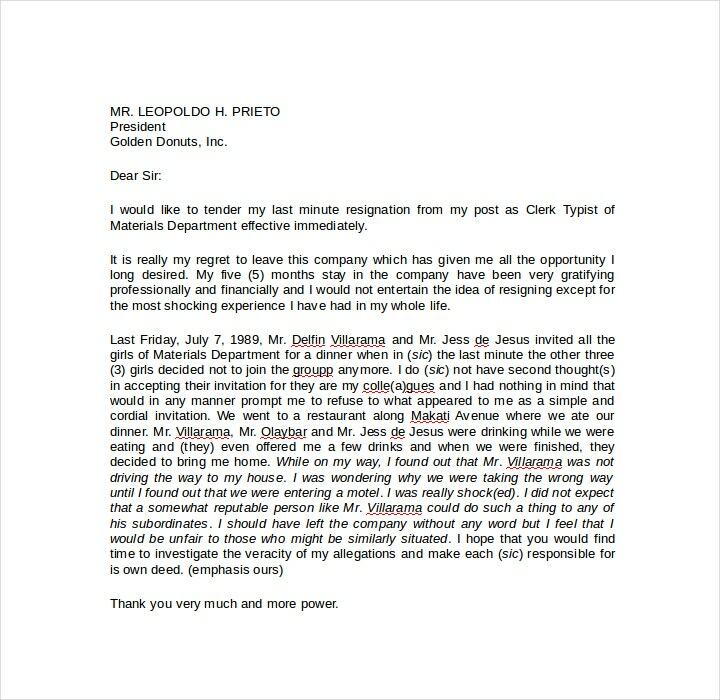 So in the first paragraph, make sure that you state the date of when you’ll be leaving the company. You have to make sure that you include this in the letter as soon as possible. If you think it’s appropriate or if it’s necessary, then you’re going to have to give an explanation as to why you’re resigning from your job. If it’s because you have a ton of workplace complaints and you feel that the company hasn’t exactly been doing a good job at handling these problems, then it’s best that you leave these details out of the letter. However, if it’s for another reason such as health concerns, then you may share it with your employer to give you some air of sympathy. You’ll have to remember that you’re going to want to make sure that you and your boss have a good relationship even after you’ve left since you might just end up coming back. Just remember to keep your letter short and don’t go into too much detail. Thank your employer for all of the work experience you’ve gained. It’s like when you have to write a thank you letter—the only difference is that you’re going to have to summarize how thankful you are in a short and simple sentence. If you want to make sure that you and your boss are on good terms, then it’s best that you express your gratitude for everything you’ve gained while working for the company. Even if you think you didn’t have that great of a time working for your employer’s company, it’s still best that you offer him or her a thank you. Offer your employer your help before you quit. Even if you give your employer only a short amount of time right before you leave, it’s still best that you extend your hand to show that you’re willing to help him or her out with the transition process. So mention in your letter that you’re willing to help out in any way until you leave the company. However, if personal circumstances prevent you from providing your employer help, then it’s best that you leave this portion out of your message. You wouldn’t want to make your employer any sort of promises that you can’t keep as it will only make you look bad. Before you send your letter, make sure that you go over it. You’re not just looking for grammar errors or typos, but you’re also trying to see if your letter is one that you’re genuinely proud of and one that has a positive tone. Ask someone like a friend or family member to go over your letter to see if there any changes that should be made. So make sure that you go over everything and make all the necessary changes before you hand the letter over. Remember that your employer is the person that’s going to be handing out your letter of recommendation in the event that you need it. If you form any sort of bad blood with the person who can affect your employment rate at other companies, then expect to only hear the negatives and none of the positives. 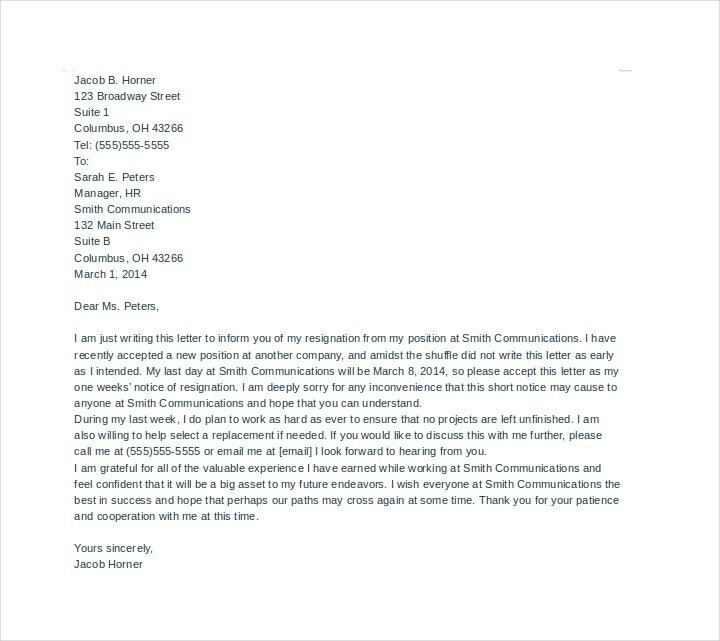 In today’s modern times, people more often choose to send their formal resignation letter via email as it’s more convenient. This is because it makes it easier for one to share the news with the employer and let him or her know about the resignation as soon as possible. So here a couple of tips for those that wish to send their resignation letter through email. Make sure that your subject line clearly conveys the purpose of the email so that your employer knows what to expect and reads it as soon as possible. In your subject line, you may also want to include your name in it. 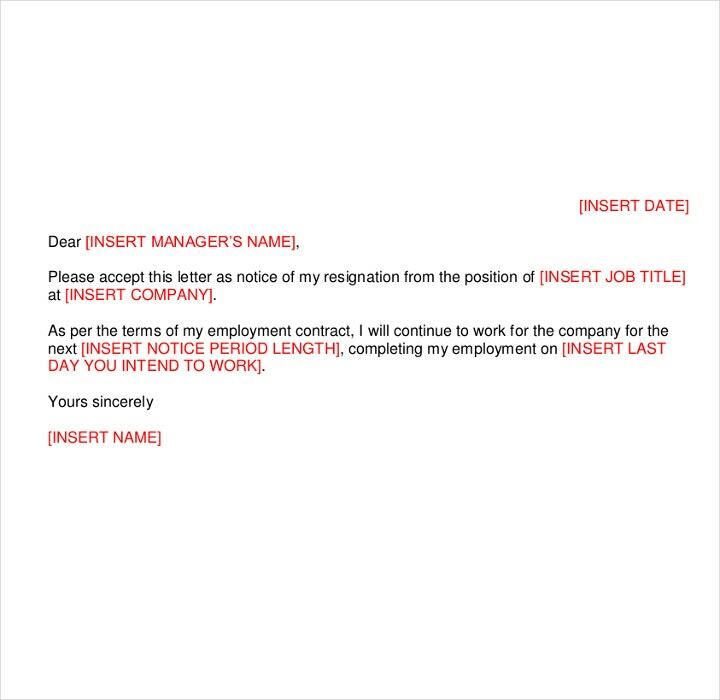 So you can do something along the line of “Resignation” as your subject line or “Firstname Lastname – Notice of Resignation” to make it really clear to your boss as to who’s resigning. You don’t necessarily have to add the date as it will appear on the email as soon as it’s received. Be sure to keep your email short. All you have to do is state that you’re leaving the company, the date of when you plan to go, an expression of gratitude for everything you’ve earned, and your assistance during the transition period (if circumstances allow you to do so). 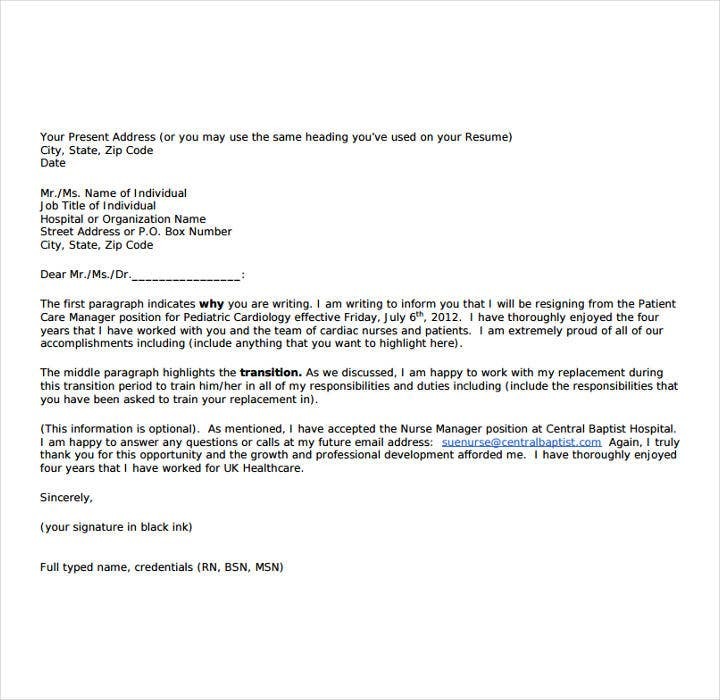 A common problem between a resignation letter template and a resignation letter that’s sent through email is that people often forget to proofread them. Just make sure that you go over your email to ensure that there are no errors. As mentioned before, you’re going to want to make sure that the tone of your message is one that shows a positive attitude and one that leaves a good impression on your boss. Also, make sure that you use a font that will ensure that your employer will have an easy time reading your email. While it may be tough to leave one’s job, sometimes it’s necessary when there are better opportunities out there, or if the company just hasn’t been doing well and there are too many problems. 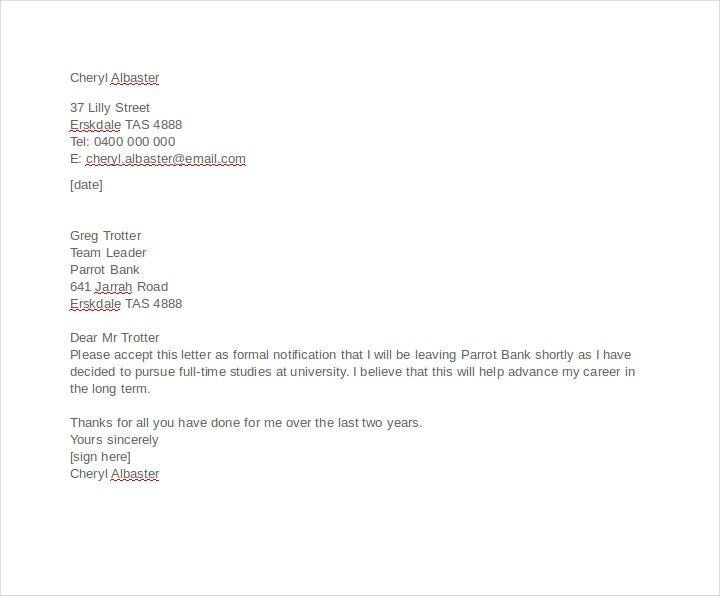 So if you plan on making any kind of professional resignation letter as well as needing to know how to use them, then go through any of our available resignation letter examples to help you out.